A little while ago, I came across this… according to recent statistics in the Wall Street Journal from the Center for Women’s Business Research in the U.S., there is only 3% of women-owned businesses with a revenue of $1million or more in The Million-Dollar Club… (and I bet that percentage is a whole lot smaller again if being the only breadwinner for the family is also taken into account). Only 3%, is that all I hear you say? Given that 7-figures is the turnover my Mother of a Business was doing at time of its Sale, that put me in the category of the 3%…are you kidding? 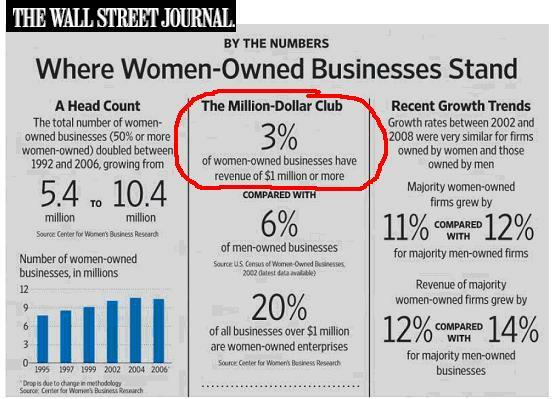 How can it be that with all the businesses started by women, only 3% manage to reach 7-figures? Why are Businesses being built if not to serve your Lifestyle, as opposed to the other way around? Nearly half (49%) of women agreed they felt disadvantaged in terms of the amount of superannuation they were able to save as a result of having to cut back or stop work. This view was even more likely held by Gen Y (63%) and Gen X (63%). We’re not in a very good place are we? Well, the majority of us that is. Business gives you Lifestyle to be the Mother you long to be. No question. In fact, it’s not just about the mothering, it’s ultimately about Lifestyle and the ability to earn what you must earn, plus a whole lot more. If the notion of a 7-figure business scares you right now, you may be thinking that it must mean a whole lot of work that will take you away from your family even more? WRONG! You couldn’t be further from the truth, provided you structure properly and of course, “Start with the End in Mind”. Ladies, we’ve got some serious Business Building and Professional Development work to do…To discuss any of this further and, most importantly, to do something about it, feel free to contact me.